As a young boy I became interested in radio when I saw my neighbour experimenting with an illegal FM band transmitter. 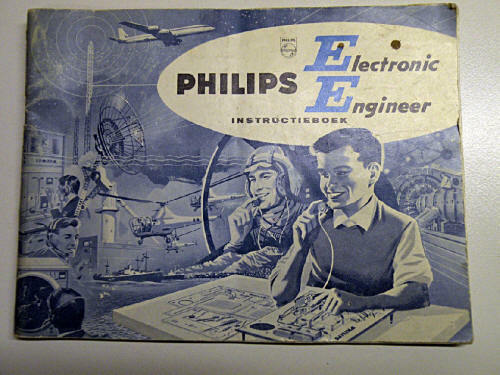 At that time I also became an engineering box for electro mechanical experiments and also I got a first electrical engineering set from Philips for many small electronically technical experiments. 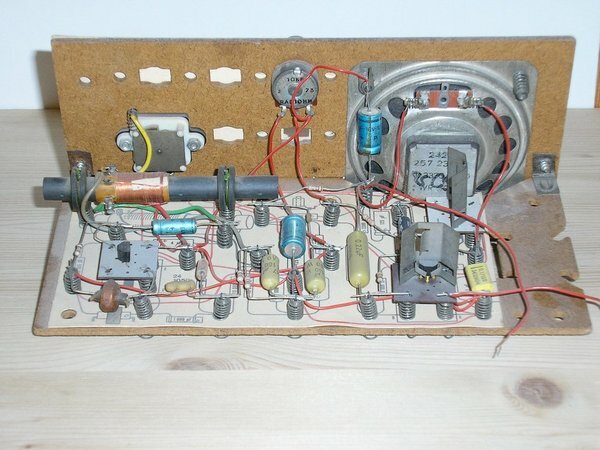 After a while I wanted to try and build the radio from a Philips radio box on a circuit board, that gave me my first soldering experience. I was a member of aviation scouts building scaled aircraft. For that I needed some remote control unit but buying it was way too expensive. There was a design for building a remote control yourself, DIGIT4, which I decided to build. When I was checking and aligning the receiver I suddenly heard voices which were drawing my attention. That was my first experience with something like ham radio being 27 MHz. I started building my own 27 MHz transceiver which worked out well with about 1.5 W output. 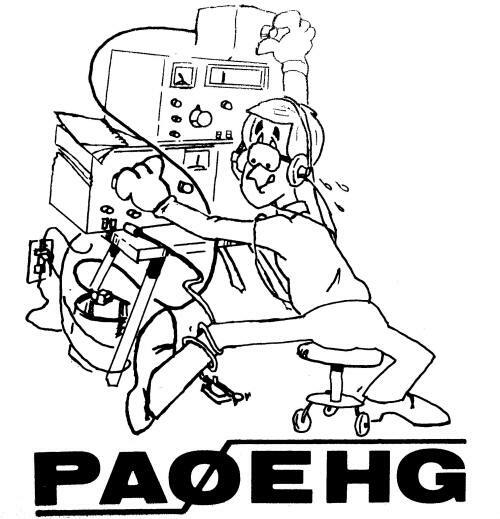 I was quite active for a while on 27 MHz and met several other locals busy for their exam for real ham radio amateur. I decided to go for that also because 27 MHz was illegal at that time. At first I wanted to get QRV on 144 MHz, I got hold of a transceiver but that was not working very well so after some time I started building my own transceiver. Based on a design from an other local amateur I started building an SSB transceiver. A few months later I started building a 70 cm transverter. Using a 26 element loopyagi I was QRV with about 30 Watt output from a single 2C39 tube. 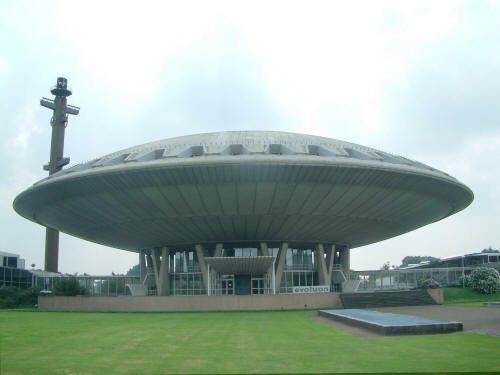 At this time I build my first Beacon PI7EHG which was situated in Eindhoven almost on top of the tower close to the Evoluon. I became interested in EME attending a lecture from Jan PA0SSB but at that time it was not possible for me to start with EME. 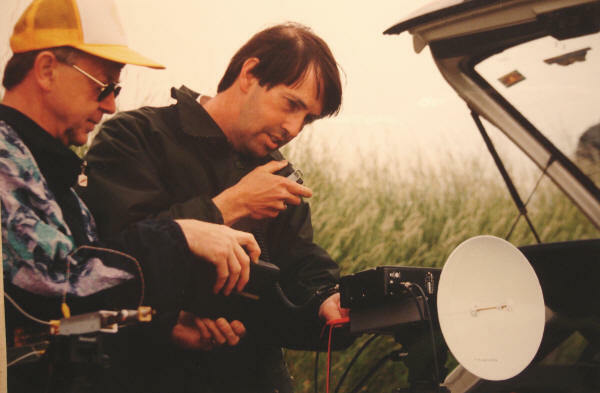 I became interested in microwave bands and in 1980 I started participation in the PA0WRC/p contest station. For the contests the microwave band were essential and I build a lot of new equipment at that time. I became QRV on 6 and 9 cm and on 10 GHz all narrow band. 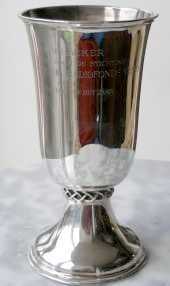 1980 third place, 1981second place and 1982 first place. In 1980 I had build my first narrowband 3 cm station existing of two step recovery multipliers one for TX with about 30 mW output and the other for RX feeding a balanced waveguide mixer, so no preamplifier yet. At that time I build 10 GHz beacon (callsign PA0MS) which was QRV from the Technical University in Eindhoven beaming North West. After some time we became a telephone call from PA0EZ who had heard the beacon the evening before. I suggested that if he heard the beacon again. we should try and make a QSO from my home QTH. That evening he called me at home and we succeeded in a two way QSO over about 95 km. This was my first narrow band QSO from my home QTH. 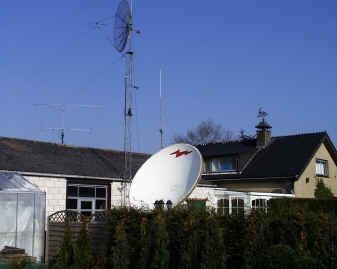 I was using a 5 meter long waveguide with a 30 cm dish on it which I placed outside my window standing against the antenna for 70 and 23 cm. That evening I also made a 10 GHz QSO with PA0JME from Rotterdam. In 1982 I started working for QRL and moved to Enschede in the eastern part of the Netherlands. In front of the window at the 9th floor I had a 10 GHz beacon QRV beaming west with a 30 cm dish. I was QRV on all UHF/SHF bands with home made equipment. 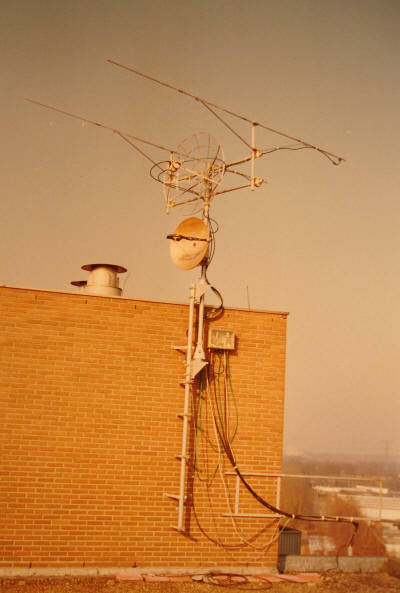 My 10 GHz station on top of the building using a 70 cm dish was used whenever I wanted to make QSO's on 10 GHz, if needed I switched off the beacon but most of the time this was not necessary. I started building equipment for 24 GHz and using a separate TX and RX I was able to do some experiments in setting up my TX at my kitchen window and then go portable with my RX tot the Holterberg about 40 km away and receive the transmit signal. I participated in the Danish Microwave activity week mainly on 10 GHz and 24 GHz. Also we succeeded on 76 GHz and my transmitter was even good copy without antenna using open waveguide on my transmitter. this produced a strong signal over 40 km distance. I build a up new antenna system for 70, 23, 13, 6, 3 bands. A few years later I also added 24 GHz. 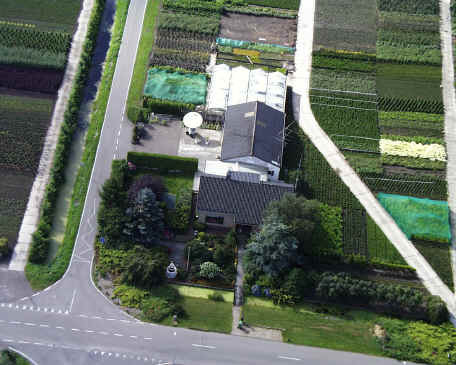 In 1995 I moved QTH to a much better location with lots of space and excellent take off into most directions. 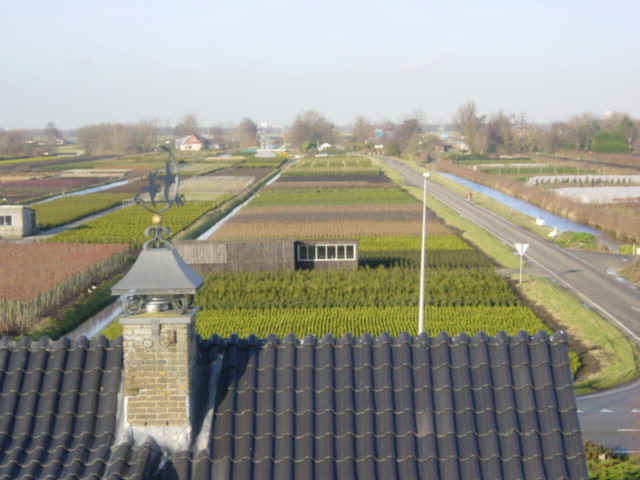 My new QTH was in the middle of the hart of Holland with most trees not taller than 1 meter high. These are pictures of the most important part of my station. Now I also had space for a big antenna, I build up an mast with a 2.5 Mtr dish for 23 cm tropo and a second mast with a 1.2 mtr dish for 13 and 9 and 6 cm. 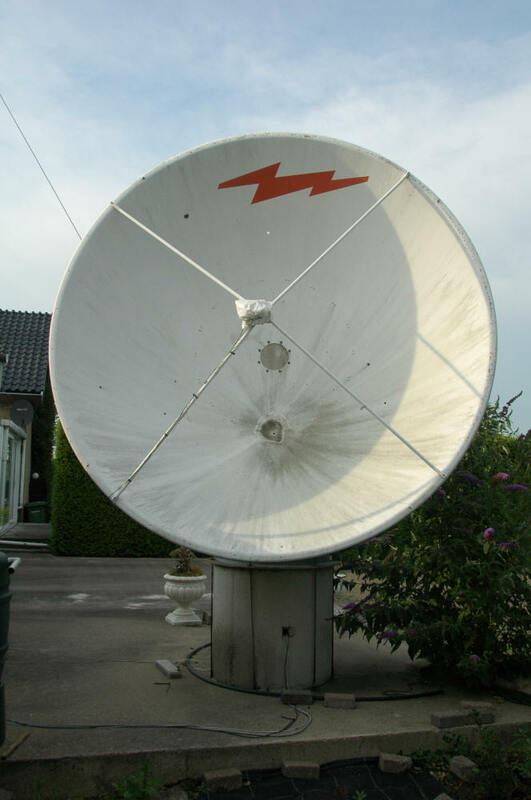 Also a 70 cm dish for 10 GHz and a 50 cm dish for 24 GHz. After the first 24 GHz worldwide EME contacts I became interested in 24 GHz EME but did not have enough power to get things going. After a few years I decided to give it a try with my 10 Watt TWT which proved to be successful.